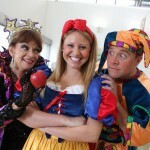 Panto time is here - oh yes it is! Here's a round-up of the best places to boo and hiss your way to hours of entertainment in Birmingham and the West Midlands. Birmingham Hippodrome has a particularly special record-breaking history with pantomimes in recent years and it doesn't stop this year as Snow White and the Seven Dwarfs is set to be Britain's biggest panto. Running from Thursday December 19, 2013 until Sunday February 2, 2014, it features a star-packed cast including How to Look Good Naked presenter Gok Wan (The Man in the Mirror), former Eastenders actor John Partridge (The Prince), Dynasty star Stephanie Beacham (The Wicked Queen), and comedian Gary Wilmot (The Dame). While Snow White is played by Danielle Hope, who won TV reality show Over the Rainbow, and other members of the cast include ventriloquist Paul Zerdin adding comedy to the show as Muddles. The production company has however said that this version of Snow White will not feature dwarf actors but represent the seven dwarfs in an alternative way. Michael Harrison, director of Snow White and the Seven Dwarfs, said: "It's a long time since Snow White was last performed at the Theatre and it seems fitting that its return as Britain's biggest pantomime should feature such an incredible cast. This brand-new production is set to be the most spectacular Birmingham has ever seen." Tickets cost £12 - £39 from www.birminghamhippodrome.com or by calling 0844 338 5000. Group bookings can be made on 0844 338 7000 and hospitality bookings on 0844 338 9000. A 'relaxed performance' for children on the autism spectrum or with learning difficulties will be staged on Thursday January 30, 2014, at 1pm. Book tickets for this performance by calling 0844 338 5000. Captioned performances take place on Sunday January 5, 2014, at 1pm and Wednesday January 8, 2014, at 7.15pm. Sign language interpreted performances take place on Sunday January 12, 2014, at 1pm and 5.15pm. Audio-described performances take place on Wednesday January 15 at 2pm and Saturday January 18 at 2.30pm. Comedian Joe Pasquale brings plenty of laughter to Sleeping Beauty at Wolverhampton Grand Theatre from Saturday December 7, 2013, to Saturday January 18, 2014. He plays Muddles in this extravagant, colourful fairytale, and is joined by cabaret star Ceri Dupree as Queen Passionella and former Coronation Street actress Lucy Evans as Princess Beauty. Romance, spells and larger than life characters make it a memorable and fun visit for children and the young at heart. 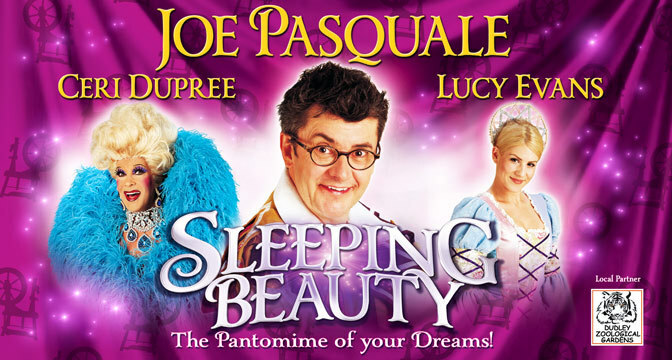 Pasquale is a particular draw as one of the most popular comedians on the theatre and panto circuit across the UK. A sign language interpreted performance takes place on Wednesday January 8, 2014, at 7.15pm. An audio described performance takes place on Thursday January 9, 2014 at 7.15pm. Audio described and sign language interpreted performances take place on Thursday January 9, 2014 at 11am and Saturday January 11, 2014, at 2.30pm. A relaxed performance takes place on Thursday January 16, 2014, at 11am. 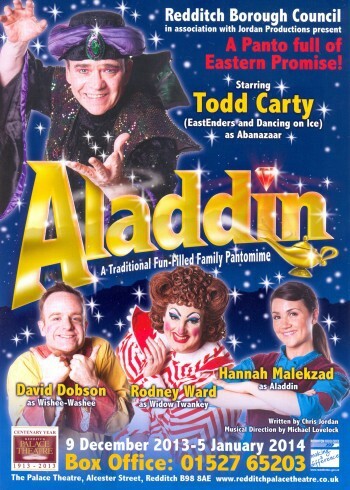 Soap stars are as much a part of pantomimes as the dame, and that is never more true than in Redditch this year as Todd Carty leads the cast in Aladdin at the Palace Theatre. From December 9, 2013, until January 5, 2014, the actor who is renowned for his role in Eastenders as Mark Fowler becomes baddie Abanazaar in the tale from the Arabian Nights. With magic flying carpets, lamps and adventures, it will be an action-packed night. Tickets cost from £16 - £17.50 from www.redditchpalacetheatre.co.uk/ or call 01527 65203. It's another Aladdin and his Magical Lamp that entertains in Sutton Coldfield from January 14, 2014, to January 19, 2014. 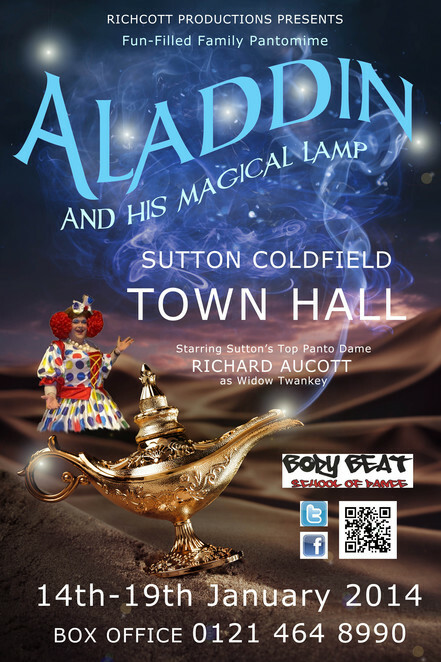 Richcott Productions is behind this traditional pantomime featuring panto favourites Aladdin, Widow Twankey and more. Tickets cost £13 from www.richcott-productions.com/ or by calling 0121 464 8990. 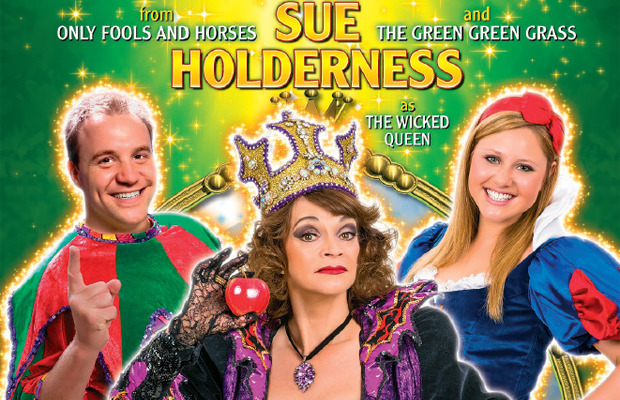 Another Snow White and the Seven Dwarfs takes centre stage in Malvern starring Sue Holderness, better known as Marlene in Only Fools and Horses. Running from December 12, 2013, to January 5, 2014, it also features Chris Pizzey, who is Stephen in The Basil Brush Show, along with dwarf actors as the seven lovable sidekicks to Snow White. The age-old tale of pure and gentle Snow White overcoming the wicked queen to find her prince is a much-loved story and panto classic. I love Stephanie Beacham. I didn't know Gok Wan did acting. Sounds like it will be a great show.